Learning Sites provides a wide variety of visualizations for your exhibitions, your educational programs, your public outreach, and your sales department. 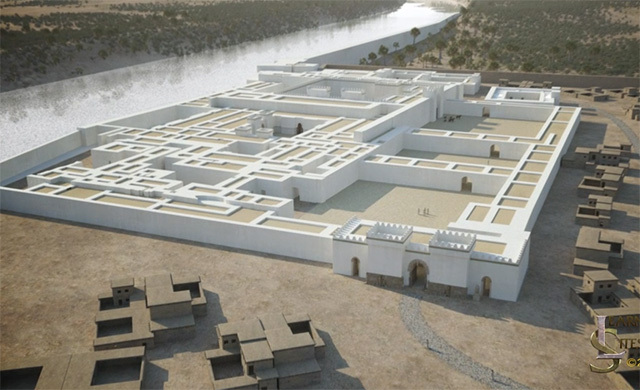 LEARNING SITES works with your curators, exhibit designers, and preparators to develop stunning exhibition visualizations (such as the re-creation of the throne room of the Northwest Palace, Nimrud, Assyria [present-day Iraq], seen at the left, hover over to enlarge; image extraced from an animated flyover developed for museum exhibition). For example, we can provide interactive virtual reality or augmented reality content, animated flyovers and flythroughs of sites and buildings, and static renderings for use as gallery supplements or additional didactic materials for exhibtions, in a wide variety of display and output formats. 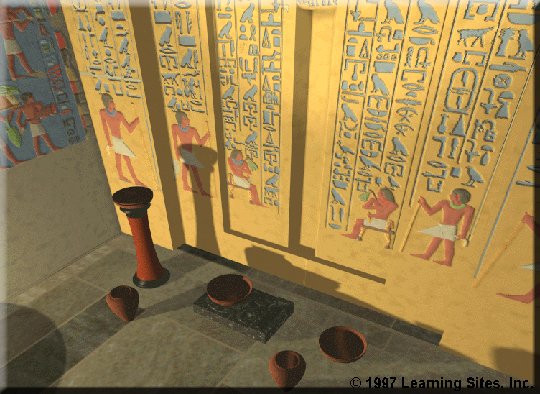 LEARNING SITES works with your education department to create instructional materials that use advanced computer graphics and that are tailored to your specific outreach objectives, re-creating the original context of objects in your collection (such as the re-creation of the funerary chapel of Ka(i)pura, Saqqara, Egypt, and its artifacts, seen at the left, hover over to enlarge). For example, choose a site or building and artifacts from your collection (on exhibit, on lonn, or in storage). We'll reproduce them as stunning 3D computer models, placing the objects in an authentic, researched simulated setting and will program the environment for virtual reality, augmented reality, or Website enhancements. Museum visitors will be able to explore the site and its objects, move around them, and get a near firsthand experience of their context. We'll also link text and still images (or narration) to objects in the interactive environment to provide teachers, students, and the general public with an exciting, engagin, and educational experience. LEARNING SITES works with your publications department to produce digital data dissemination packages containing interactive 3D models of your architectural and archaeological materials, to supplement your print publications or as individual products for your shop, online catalogue, or other distribution venue. For example, a 3D computer model can serve as a visual index to a publication, allowing users to walk through buildings or sites and select with just a mouse click the artifact or architectural element about which they want additional information (such as catalogue data, discussions, bibliography, or drawings). A model can also be used to create an online animation or a virtual world to enhance your institution's Website and social media presence. LEARNING SITES also works with your archaeologists and conservators to aid in the collection, analysis, and long-term care of your objects and related research materials. For example, we can provide guidelines and software for quickly photomodeling your objects to create interactive 3D models of them to benefit in-house cataloguing, online research, and insurance premiums when shipping objects to other museums for exhibit. 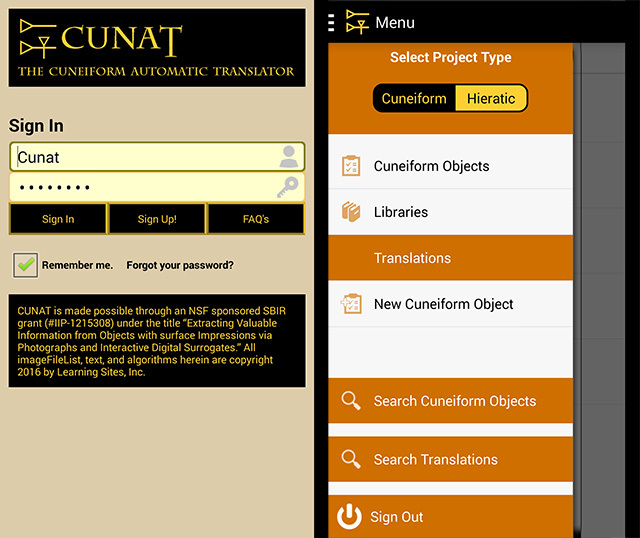 Our smartphone apps assist in quickly translating your cuneiform and hieratic texts (at the left, a few screen grabs from the current CUNAT automated translator app, hover over to enlarge). 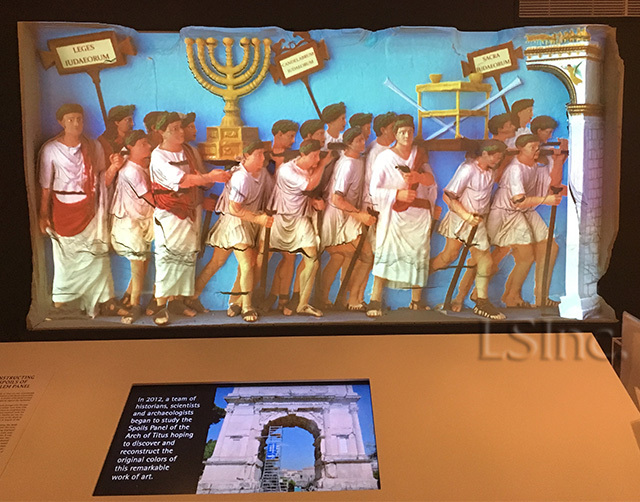 Photo from the mixed reality exhibition of the spoils panel from the Arch of Titus, Rome, developed for the Yeshiva University Museum (NYC), which combined a full-scale replica of the spoils panel onto which is projected a digital colorized reconstruction of the relief (a view of the sculpture unseen for 2000 years). 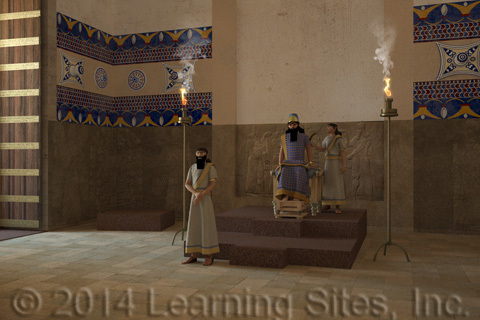 Snapshot from LEARNING SITES Northwest Palace at Nimrud animated flyover (developed for the Metropolitan Museum of Art, NYC) and virtual reality package (developed for the Williams College Museum of Art, Williamstown MA). 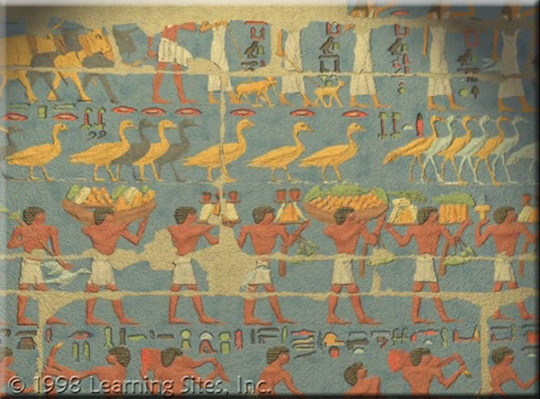 Screen grab from the LEARNING SITES animated and narrated flythrough of the Funerary Chapel of Ka(i)pura, Saqqara, Egypt, for a traveling exhibition featuring related objects from the site. 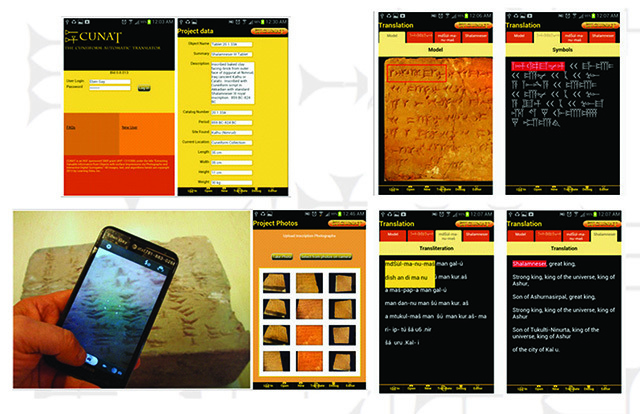 Screen grab from the LEARNING SITES smartphone app for automatically creating interactive 3D models of objects and for translating cuneiform and hieratic texts. These are only a few of the possibilities afforded by a LEARNING SITES approach. None of these visualizations or tools has to stand alone; one department's application can be built to complement another's, providing an integrated solution to exhibition display, data access, and public outreach. Some of the museums with which we have worked: the British Museum (London); the Louvre (Paris); the Metropolitan Museum of Art (NYC); the Denver Art Museum; the Ashmolean Museum (Oxford); the Hood Art Museum (Dartmouth College); the Williams College Museum of Art (Williamstown MA); the Dallas Museum of Art; the Miho Museum (near Kyoto); the Bible Lands Museum (Jerusalem); the Semitic Museum (Harvard University); the Petrie Museum (London); the University of Pennsylvania Museum of Archaeology. Tell us how our expertise might benefit your institution. Contact us to become part of the growing LEARNING SITES global online bi-directional archaeological research and education network.